Is there anything better than Nutella? For the longest time, I didn’t think so, except for when I’ve had Nutella in Europe. Apparently they make it differently over there. Of course. Fighting words indeed. So what could I do? A taste test was in order. I decided to test the two spreads on toast, which is the normal, all-American way to eat Nutella. At least at my house. The 11-year-olds chewed their respective pieces of toast thoughtfully. But they both came down in favor of Nutella. 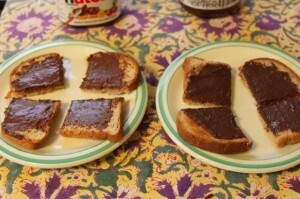 Then they asked me to make them Nutella toast for their Friday afternoon snack. 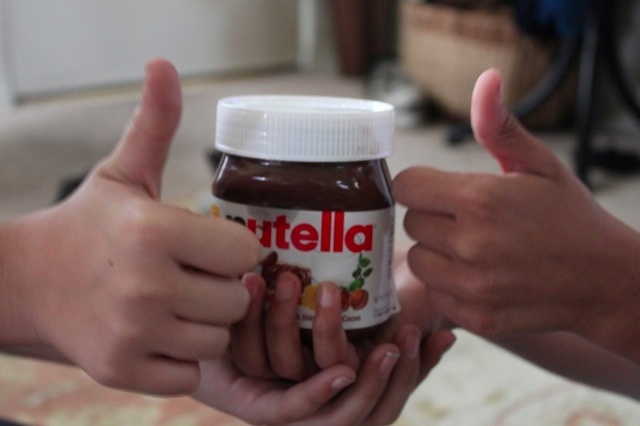 The teen also favored Nutella, although she offered her typically taciturn response; a wrinkled nose at the almond spread and a nod and a point at the Nutella before exiting the room (and asking me to make her my famous Nutella Bap, which is Nutella on a bollilos roll). For the two adult tasters, however, the results were less clear-cut. “It’s excellent,” said the Ex, trying his toast with coffee. “The almond flavor really comes through, but subtly.” However, he did agree that Nutella still held its own. And what did I think? 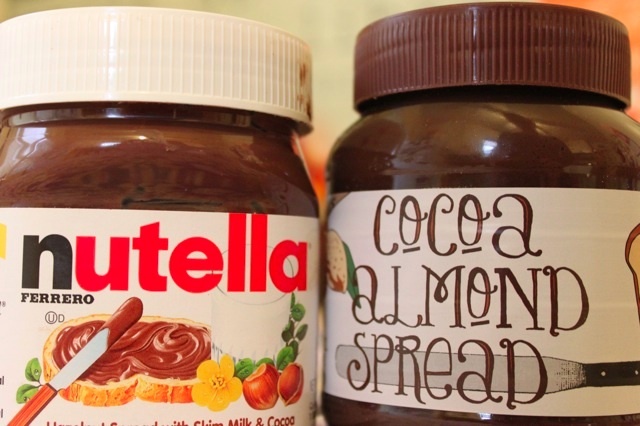 I think I’m trained to love the taste of Nutella, so that new and competing brands of chocolate spread have to fight first through that bias before working its wiles on me. But after a couple of chews I decided I liked the nuances of this new spread just fine. I also wondered what it would taste like underneath some cashewnut butter, although is it wrong to mix almonds and cashews in such a reckless manner? No matter. 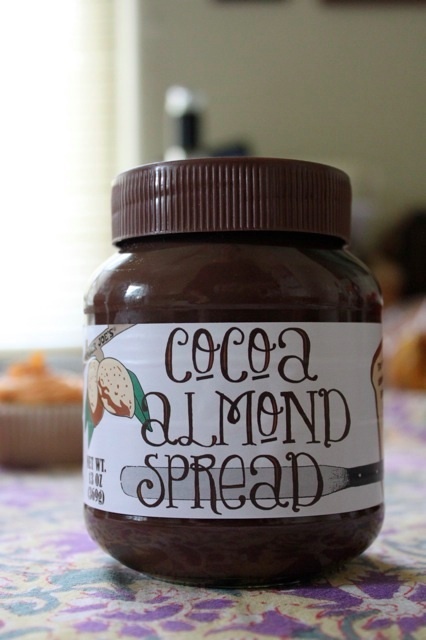 I could learn to love Cocoa Almond Spread. I bow to the crowd, however. The result? Nutella wins this round. Which is not to say I won’t be buying TJ’s Cocoa Almond Spread. Especially if Fresh & Easy, my Nutella supplier these days, ever decides to stop carrying it. Who knows? Maybe the fam will come around to its charms. Your verdict? Talk to me chocolate spread lovers! OK, get thee to an Italian market and buy the REAL Nutella, the version they import from Italy. It is far, far superior to ours. Taste test it and see for yourself. I KNEW it!! Dorothy, WHERE do I find this Italian market in LA?? Tell me!!! You can buy large containers of Nutella at Target now (although not the Italian one). I will have to try the TJs spread as well. Susan – large containers of Nutella would just be dangerous at my house…The teen would probably bathe in it…But I still want to know where I can get the Italian version…. Tried TJ’s today and I want more! It’s better, but I have to agree with everyone who says the European version is tough to beat. It does taste different here, which is why I’m diggin on TJ’s. I’m not a huge Nutella fan, too sweet and iffy on hazelnuts. TJ’s cocoa almond spread. Ummmmm, I loved it. Now trying to think what else to do with it. I’ve used it as a dip for almonds and pecans (yes you can mix nuts!) and am considering it with vanilla ice cream. Does it melt well? Haven’t tried it yet. TJ, this ALMOST makes up for doing away with the milk chocolate covered almonds. Do you detect a trend here? Plebian milk chocolate tastes! 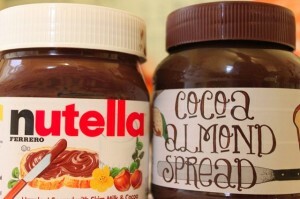 They both come in 13 oz sizes, and the TJ is only about 50-60 cents less than the Nutella .. I actually far prefer Trader Joe’s chocolate almond spread. I’ve never had the European Nutella, so I cannot compare it to that, but I find the American Nutella way too sweet and the chocolate is a bit wimpy. The chocolate almond spread has a much better texture than most Nutella wannabees, and it seems to have a milder but darker chocolate flavor with a tastier (smaller) amount of sugar. Then again, I generally adore everything lightly sweetened, but am not too interested in either the heavily sweetened or the unsweetened. I was baking cookies (hamentaschen) with nutella as the filling, and I ended up mixing nutella with finely chopped dark chocolate. Mmmmmm. Perfection. (It wouldn’t work so well outside of baked goods though, because it murders the texture). Dulin – Yeah, it’s sort of a tie for me…I will use either on my morning toast…as long as I have a lot of cashewnut butter to spread over it…that’s the way to eat chocolate spread! We loved the TJ’s spread on their coconut Toasted Coconut Thin cookies. A desert you could bring or serve at a party. We don’t eat a lot of sugar but, yummmmmy! these were great We know they’re not great for you, but a little goes a long way. I don’t like Nutella, hazelnuts are horrible! But this Cocoa Almond spread is MAHVELOUS!! I eat it on EVERYTHING, it tastes wonderful on my banana chips, on giant blueberries, on apple slices, along with every kind of bread! !